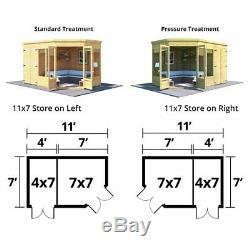 11x7 Corner Pent Summer House Right Side Store Garden Wooden Shed Dual Room New. Overall Dimensions (11 x 7). Dual Room building - Modern Summerhouse and Shed. STRONG T&G build and EXTRA-TALL. Available in 11x7 size - left and right store. Long Windows and Doubled-Door Feature. Included: Pre-assembled T&G Floor and Roof. Base Coat Treated for Transit. We offer different sizes of the log cabin/ summer house See our other listings in the summer houses/verandas shop category please. We offer pressure treated option >. Additional cost (message us for the price). 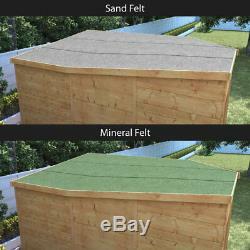 We offer variety of Roof Felt: Sand Felt, Green Mineral Felt. > Additional cost (message us for the price). We offer variety of standard colors for your. Trim ; Slate Grey, Black, & Cream > Additional cost (message us for the price). We offer variety of standard colors for your Wall: Harvest Gold, Evergreen, Dark Brown, Cedar Red, Warm Grey, American Barn Red, Beaumont Blue, Spruce, Cornflower, Pale Sage, Gun Metal Gray, & Lilac > Additional cost (message us for the price). We offer extras such as the Padlock & Hasp, Silicone & Gun Set, Value Assembly Kit, Deluxe 50mm Padlock Protector option. We also offer the following styles of shelving: (Additional cost, message us for the price). Two Sides - Add shelving down both sides of your summerhouse, increasing the storage potential of your new summerhouse. One Side - Add shelving down one side of your summerhouse, adding to the storage potential of your new summerhouse. Tall Unique Pent Summerhouse Design made in Great Britain. Take a look at the Penton summerhouse, unique in design and style. Built with two separate rooms, the Penton has a cosy summerhouse space with shed storage attaching to either the left or right hand side of the unit. Perfect for relaxing, without having to sacrifice any storage space. The outdoor unit has a total size of 11x7ft, meaning it fits directly into a corner. Its an ideal space for couples, new homeowners or small families. With a 4x7 side storage section attached, its also a great space for avid gardeners to store any equipment or goods. The summerhouse room is 7x7, so for any of those busy days outside, you can quickly tidy up and easily store your goods away, then dive into a good book! Included 11mm Assembled Floor as standard. The Penton Summerhouse utilises 11mm tongue and groove flooring. This gives the outdoor garden unit an all-compassing smooth finish. 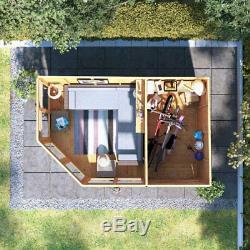 The floor is designed to withstand all domestic use, with both the summerhouse and storage shed using T&G construction. 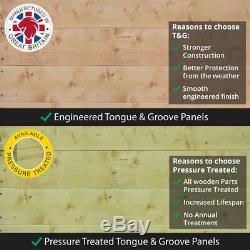 The wooden boards interlock together providing long lasting strength and durability. T&G gives the best possible protection against the weather, with no water entry, meaning there is no moisture damage to the joints. The floor could easily be the most abused part of any building. This is why Picton is meant to have T&G floor and thick bearers. Ordering your Picton Summerhouse with Pressure Treated option further enhances the longevity and protection against elements of the whole building including the floor. Included 11mm Assembled Roof as standard. For the best protection against the elements, the Penton roof is also designed using tongue and groove construction. With a pent design, water is able to run off the back of the building preventing any rainwater entry. To maximise headroom within the building there are no truss and roof supports needed, creating an airy space perfect for long summer evenings. Experts say that the roof would have to be one of the toughest yet most bombarded sections of the building. We recommend all our customers to enhance the defensive capability of their roofs further by ordering their Picton summerhouse pressure treated. The treatment dramatically increases the durability of your roof and frees you of your maintenance worries. Tall Windowless Pent Side Storage. 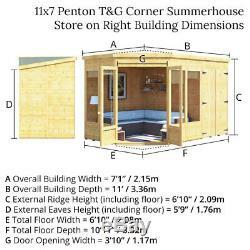 With the Penton summerhouse, you can choose to either have a left or right sided pent shed. Instead of having both a summerhouse and a shed, we have decided to incorporate both into one. Utilising garden space, the side store is 4 x 7, with a deep storage space you can transport any of your outdoor furniture, or fill it with any gardening equipment. The braced double door opening is specifically located to enable the maximum opening, and not compromise the summerhouse room. The wide opening and deep storage space means its perfect for bikes or lawn mowers. We want to make sure you dont have to compromise when it comes to having either a garden shed or summerhouse, so weve given you two in one. If youre trapped for garden space, or have one corner taken up by a tree, you can select which side to place your storage shed on. That way you can have your Penton facing your garden. With the building fitting perfectly into your garden space, take advantage of the panoramic window design and enjoy glorious garden views all year round. Fantastic during the summer months, the sun lights up the entire building, creating a warm cosy space. Take advantage of having the shed attached, on either side and keep your summerhouse clutter free, moving in any rattan furniture, barbecues or outdoor dining sets! 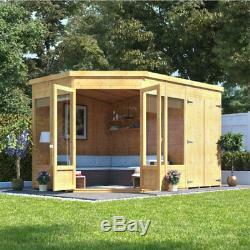 With the 7x7 added storage shed, you dont have to utilise your summerhouse as storage. You can go into the Penton with your cosy summerhouse room already organised and not have to worry about any untidiness! Strong T&G Build and construction. The Penton summerhouses has been designed using the extremely durable wooden tongue and groove panels. The classic T&G style adds to the authentic, rustic style of the outdoor unit, incorporating a smooth engineered finish. The boards interlock together to give the unit its incredible strength, whilst giving incredible weather protection. With no rain entry, water simply runs down the building, with no damage on to the joints, preventing any long term moisture damage. The T&G engineering keeps out water--but not moisture. Moisture is the perfect growing environment for moulds. This is why we treat wooden buildings. Taking advantage of the Pressure Treated option with the Picton Summerhouse, coats each wood with treatment not only on the surface area but inside out. Modern Door and Window Design / Double Shed Door. Sticking to a contemporary, sleek design the Penton has a modern door and window design. 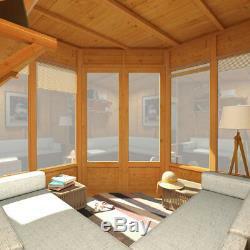 The stylish building uses 1.8mm styrene for both the doors and windows on the summerhouse section of the unit. The pent side storage uses 11mm tongue and groove braced double doors. With a 4ft opening this gives you plenty of space for manoeuvring goods, ideal for moving in and out your summerhouse goods, the storage is perfect for safely keeping expensive power tools and gardening goods. Designed to fit perfectly into a Corner. We appreciate that as garden spaces change, fitting both a shed and summerhouse can be difficult. To make the most out of your garden room the Penton has been designed to fit perfectly into a corner. You can enjoy being tucked away, comfy and cosy in your summerhouse. Here at garden Buildings Direct we dont want you to have to compromise on style or quality because of garden size or style. With a perfect fit into either the left or right hand corner of your garden, the summerhouse remains central, with double doors opening up into the centre of your garden. 11 x 7 Pressure Treated. Door Opening Size (w x h). 117.2cm x 172.6cm. 126.1cm x 363.5cm. Red Cedar Water Based Treatment for Transit. 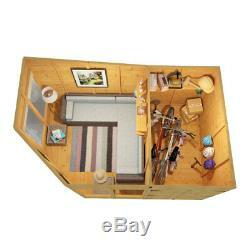 Storage Shed, Windowless Security Shed, Bike Storage, Potting Shed, Corner Shed, Summer House. The item "11x7 Corner Pent Summer House Right Side Store Garden Wooden Shed Dual Room New" is in sale since Sunday, April 15, 2018. This item is in the category "Garden & Patio\Garden Structures & Shade\Garden Sheds". 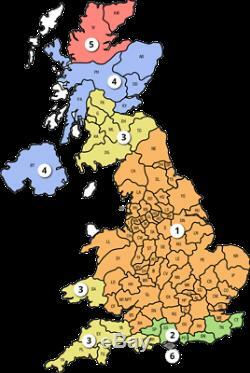 The seller is "uk-sky-1" and is located in London. This item can be shipped to United Kingdom.